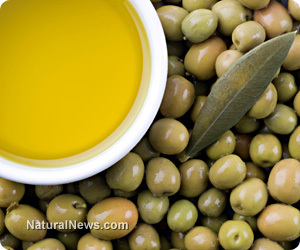 (NaturalNews) If you are an avid viewer of cooking shows, you know that olive oil is a staple in most top chefs' creations. Cooking connoisseurs enjoy using this oil because of the unique flavor it brings to food. Olive oil is made from olives, most of which originate from the Mediterranean region. People in this region are revered for their longevity and their luscious hair and skin. This may be because olive oil is a staple in their diets. As more people are starting to realize the overall health benefits of olive oil, its use is growing in popularity. When you digest your food, free radicals that are naturally produced by the body can damage the cells. Free radicals from environmental factors such as dust, smog, cigarette smoke and pesticides don't help the situation. The antioxidants contained in olive oil can help fight off and repair some of the damage that free radicals can cause. The problem with a lot of commercial skincare products is that the moisturizing ingredients don't penetrate the skin. Extra virgin olive oil is composed of more than 80 percent oleic acid. This substance easily penetrates the skin, and allows the oil to heal damage, reduce wrinkles and improve texture. Olive does more than make scrumptious dishes. It is well documented that, when combined with a nutritious diet, this oil's antioxidant properties can have a positive impact on cholesterol levels and heart health. In addition, when added as part of a regular beauty regimen, it can improve the health of your skin and hair.